Lava erupted from Kilauea fissures on Thursday, May 3, 2018, forcing evacuations. Hours after a 5.0 magnitude earthquake rocked Hawaii on Thursday, lava began to erupt from a crack in Kilauea volcano’s rift zone at about 4:30 p.m. The lava set trees on fire, forcing evacuations in Leilani Estates, a community located on the eastern side of Big Island. Although the eruption subsided at about 6:30 p.m., a second eruption occurred around 1:30 a.m. Friday morning, following more than a dozen small earthquakes. 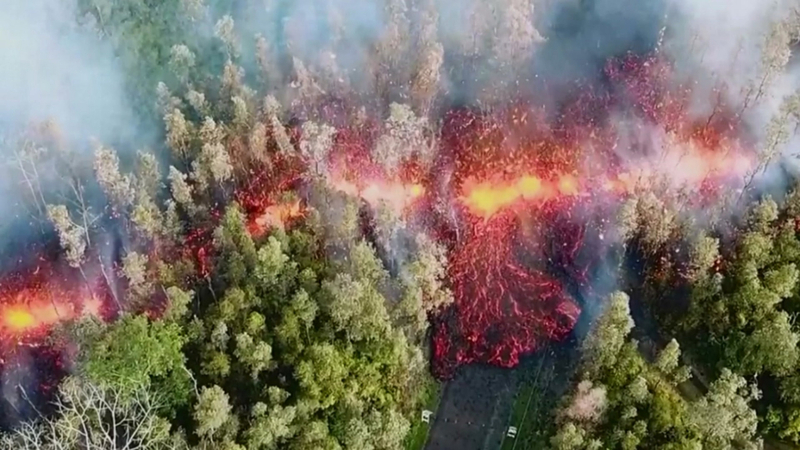 Lava from both eruptions was reportedly seen reaching heights of over 100 feet in the air as it burst from cracks in the roadways. Following the first eruption, Governor David Ige activated the National Guard and issued an emergency disaster proclamation. Following the second eruption, Hawaii County Civil Defense issued notice at 4:20 a.m. that all residents in Leilani Estates and Lanipuna Gardens Subdivisions are required to evacuate. In addition to fire dangers posed by lava, “extremely high levels of dangerous Sulfar Dioxide gas” were reported in the area.